The Rulebook and Drug Testing Policy for the 2018 Reebok CrossFit Games season have been released. It’s time to learn the rules of CrossFit competition. These documents contain pertinent information for the season, whether you're competing in the Open for fun or hoping to advance to the Online Qualifier, Regionals or the Games. You’ll notice the word “new” highlighted in red next to sections that have been added or modified in 2018. 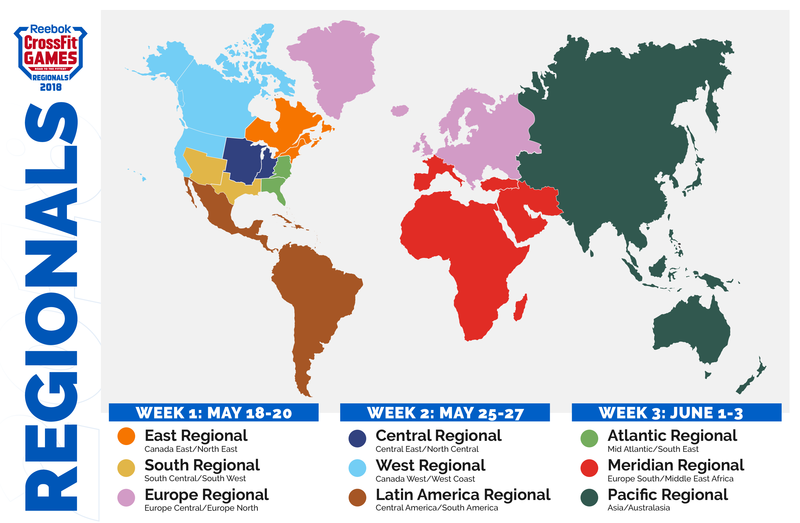 Late last year, we announced the decision to expand the number of Regional events from eight to nine, bring back the Latin America and Europe Regionals, and consolidate to five north American Regionals. Additionally, we’ll see new rules around region selection, video requirements and team eligibility requirements. We recommend you review the Rulebook if you plan to participate in the 2018 season. We’ve highlighted a few noteworthy sections below. Section 1.05 explains how the new region format will affect athletes as they choose their regions prior to the Open. During the registration process, athletes will provide information to establish their competitive region for the Open. Athletes will remain assigned to this region throughout Regionals and the Games. Residency requirements used to determine an athlete’s region are NOT based on country of origin, passport held, or nationality, but solely on where the athlete is living at the close of the first Open workout. For the vast majority of athletes, their region will coincide with where they live, work and train on a daily basis. There are 18 regions worldwide. The regions are: Asia, Australasia, Canada East, Canada West, Central America, Central East, Europe Central, Europe North, Europe South, Mid Atlantic, Middle East Africa, North Central, North East, South America, South Central, South East, South West and West Coast. A map of the regions can be found HERE. Section 1.10 addresses the move from six (6) team members to four (4). Teams will consist of at least two (2) men and two (2) women who validly register for the Open and train primarily at the same gym (defined as the same physical location) starting no later than January 1 of the current competition season. Athletes may only compete for one team during each CrossFit Games season. Any athlete requiring assistance to determine their eligibility for a team should contact support@crossfitgames.com prior to joining the team. Section 1.12 explains what makes an athlete eligible to compete on an affiliate team in 2018. Athletes competing for a team must train primarily at that team’s gym (whether a CrossFit affiliate or not) for the duration of the CrossFit Games season. The team members’ training days and workouts should take place at the team gym starting on January 1 or earlier. Team athletes must train at the designated team location for a minimum of three (3) days a week. The minimum requirement must be met for the duration of the CrossFit Games season. Team members are required to continue training with their team until the team is eliminated from competition or until the start of the Games. Section 1.13 explains how to track your weekly workouts in order to remain eligible to compete on an affiliate team. An athlete is required to travel for work for a couple weeks (consecutive or not) during the season, yet prior to leaving and upon his or her return, he or she meets the minimum requirement of three days a week at the team training facility. An athlete is a student on holiday and may not be able to return to the team training facility by the January 1 start date, yet prior to leaving and upon return, he or she meets the minimum requirement of three days a week at the team training facility. Section 4.15 highlights the prize money that will be awarded this year. Prize money is the same for men and women. Cash prizes will be awarded to the top performers. All cash prizes will be paid in U.S. dollars. The 2018 Open begins Feb. 22. Registration starts Jan. 11. Review the Rulebook and Drug Testing Policy carefully in order to understand and enjoy the events. Visit the Help Center to learn more details.